To control the humidity of the air down there—and thwart the growth of mold and mildew—get the right device. 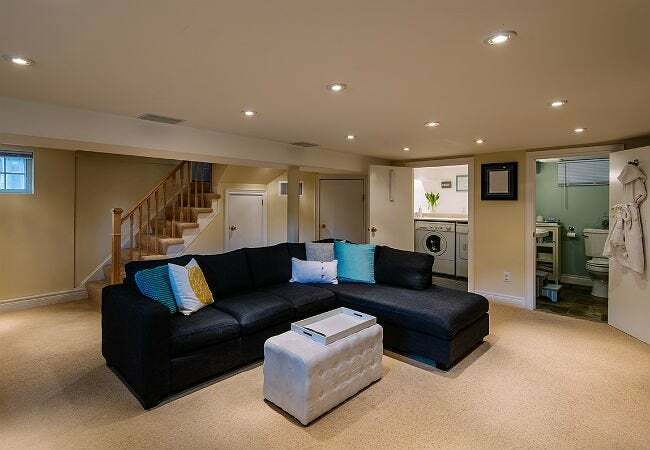 Because they’re located below ground level, basements tend to absorb moisture from surrounding soil, making them damp and musty, which can lead to mold and mildew growth. You probably know that inhaling mold spores can incite respiratory and allergic disorders, but you might not know that high humidity can also damage furniture and other items stored in the basement. Humidity levels also have an effect on your personal comfort. Ideally, they should be between 30 percent and 50 percent; any higher and you’re likely to feel chilled or sweaty (depending on temperature) because humidity inhibits the evaporation of perspiration. If you’re in the market for an appliance to remove excess moisture from the air, read on. 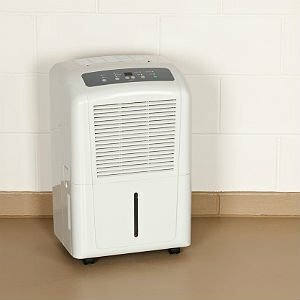 You’ll learn how to choose the best dehumidifier for your basement (as well as other areas in your home) and get the lowdown on our top picks. Dehumidifiers operate in different ways, and some methods are better suited than others to the high humidity levels found in basements. • Compressor dehumidifiers: The majority of dehumidifiers use a compressor to operate a fan that draws air over cold coils, causing moisture to condense (like droplets on the outside of cold drink). The droplets then run into a tank, which must be emptied regularly, or to a floor drain via a drain hose. Compressor dehumidifiers are some of the best dehumidifiers for basement humidity. • Desiccant dehumidifiers: In this type of dehumidifier, moist air is drawn through a filter made of a desiccant material (a chemical drying agent). The desiccant traps the moisture, which then drips into a collection tank. Desiccant dehumidifiers can control moisture levels in small rooms above ground but may not be powerful enough for basements. • Thermo-electric dehumidifiers: Also known as “Peltier dehumidifiers” after physicist Jean Charles Peltier, who discovered the thermo-electric method of extracting moisture from the air, these units work by drawing moist air along the surface of small heated surfaces (called “sinks”) where it collects and then drips into a collection tank. 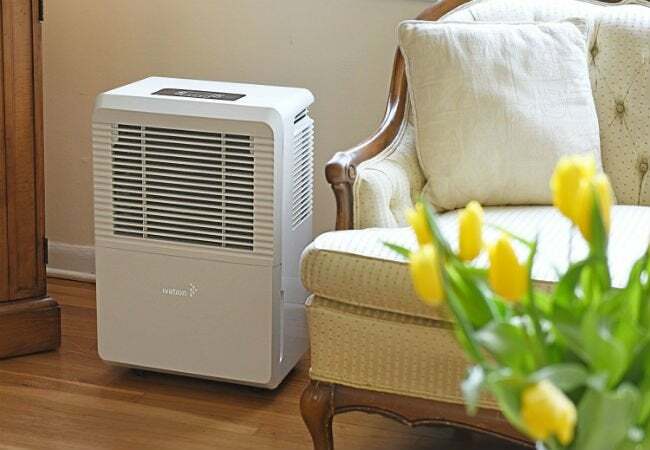 Thermo-electric dehumidifiers operate best in warm rooms, and they’re often on the small side, so they may not be the best choice for a large or cool basement. Dehumidifiers are categorized by capacity (how much water they can remove from the air per day.) Though labeled “small, medium, and large,” this refers to their power, not to the size of their collection tank. Collection tanks hold between one to three gallons, and as a general rule, the more powerful the dehumidifier, the greater its capacity. To remove the high level of humidity present in many basements, a large-capacity dehumidifier is necessary. • Small capacity: These lightweight, portable, and affordable ($45 to $90) units collect an average of 15 to 30 pints of moisture from per day. They’re well-suited to small rooms or closets. 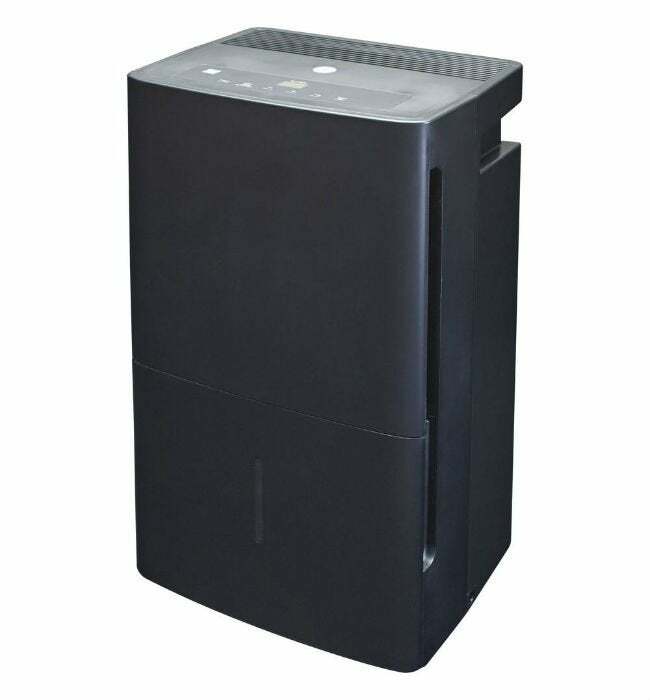 • Medium capacity: Capable of collecting 30 to 45 pints of moisture per day, medium-capacity dehumidifiers work well in medium-sized to large rooms but may not be powerful enough for a basement. They cost between $115 and $200. • Large capacity: With the ability to remove up to 75 pints of moisture per day, a large capacity dehumidifier is the best choice for a basement. Expect to pay between $180 and $300. All dehumidifiers come with collection tanks, but some models also offer the option to attach a drainage hose (typically a standard garden hose) to direct collected moisture into a floor drain. The unit will automatically shut off when the collection tank is full, so if you won’t be able to empty it daily, you should probably purchase a unit with a drain hose. Keep in mind that a pint weighs approximately one pound, so while a large capacity dehumidifier can collect up to 75 pints a day, tanks generally hold up to three gallons to allow for easy, frequent emptying—only the mightiest bodybuilder would want to haul a 75-pound collection tank around! It costs an average of $15 to $50 per month to operate a large capacity dehumidifier, depending on your utility rates, the size of your basement, and the humidity levels. While today’s dehumidifiers are more energy efficient than those of a decade ago, it’s wise to look for the Energy Star label when shopping. These models are the most efficient and you could save up to 30 percent on energy consumption over a standard machine. All dehumidifiers let you choose a basic humidity level—normal, dry, or very dry—but some have additional features that you might find useful. • Digital controls that allow you to select the desired humidity level by percentages, such as 35 percent or 45 percent humidity. The unit will shut off automatically when the moisture in the room meets the preset level, and then turn back on as necessary. • A timer you can program to turn the dehumidifier on/off automatically at a preset time, so you needn’t do so manually. • An auto-restart feature to turn the unit back on after a power disruption, such as an energy outage. • An easy-carry collection tank with comfortable handles and a well-designed spout that lets you dump water without spilling. • A frost sensor to detect frost buildup and turn the machine off to save energy. When a compressor unit runs for long periods of time, frost can develop on the coils, which reduces the dehumidifier’s effectiveness. So while a unit with frost buildup will continue to run, it will no longer be effectively removing moisture from the air. Some models also come with a restart feature that turns the unit back on after the coils have defrosted. To control the high levels of humidity found in basements, the best choice is a large capacity, compressor-type dehumidifier. The three best dehumidifiers for basements listed below all did great in independent testing and got rave customer reviews. One of these powerful machines will surely let you say goodbye to musty basement blues. The consumer products testing site Wirecutter chose the Frigidaire 70-Pint Dehumidifier as its top selection for effectiveness and ease of use. In tests conducted in a century-old stone basement, the unit reduced humidity by 20 percent and maintained a consistent level. The Frigidaire’s 1.6-gallon collection tank is easy to detach, and it comes with a hose outlet (hose sold separately) for drainage into a floor drain. Amazon customers also endorsed the Frigidaire, awarding it 4.3 out of 5 stars for durability, effectiveness, and quiet operation. It features a digital readout, a 24-hour on/off timer, and you can preset the desired humidity level while monitoring the current humidity level. The Frigidaire is Energy Star certified, weighs 47 pounds, and comes with a one-year limited warranty on the body and a two-year limited warranty on the compressor. Available on Amazon. With an adjustable fan speed, an easy-to-program LCD interface, and the ability to maintain preselected humidity levels in large areas, it’s easy to see why the Ivation 70-Pint Dehumidifier earns 4.5 stars from satisfied Amazon buyers. Consumers like that the Ivation is easy to move from room to room (it weighs just 40 pounds and comes with caster wheels). With a 70-pint capacity, it’s powerful enough to dry out even the dampest basements. Consumers can monitor the current humidity level and program the unit to come on at preset times. The Ivation features an easy-empty 1.3-gallon tank and an optional hose connection (hose sold separately). It also has an automatic shutoff and a restart sensor that detects frost buildup and turns the unit off to allow the frost to melt before turning back on. Some customers say the unit only sounds like “white noise” while others find the noise level distracting. The Ivation is Energy Star certified and comes with a limited one-year warranty. Available on Amazon. Home Depot buyers give the GE 70-Pint Dehumidifier a hearty 4.7 stars for dependability and efficiency. 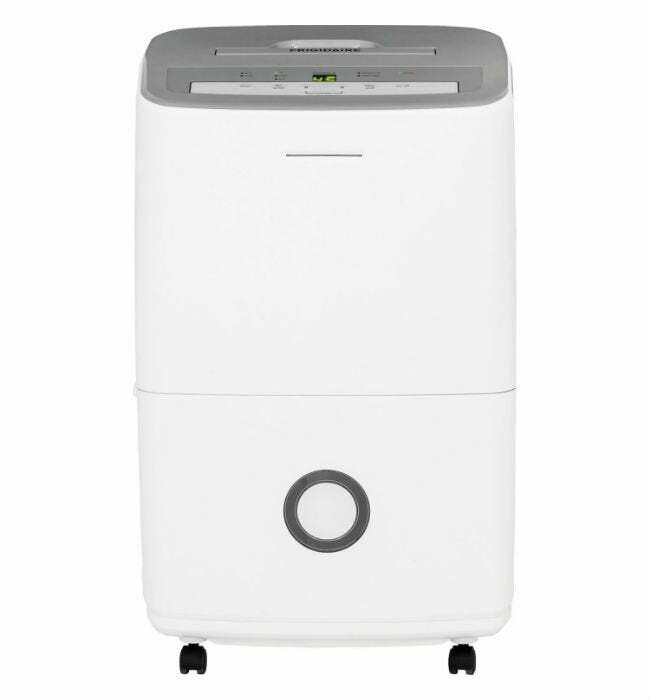 The GE dehumidifier comes with pocket handles and hidden wheels that make it a cinch to move. There’s a drainage hose connection (hose sold separately) and an easy-to-program LED panel that lets you select one of three fan speeds and desired humidity level. The unit also features a frost sensor and an automatic shutoff in addition to a “full bucket” indicator. The two-gallon tank features an easy-carry handle, and happy customers cite the GE’s ability to quickly remove excess humidity, resulting in fresher-smelling basement air. Most customers found the unit to be very quiet, some claiming they barely hear it operating. It has a limited one-year warranty. Available from Home Depot.